That was my remodeling project... Worth can't claim that.... We would either make him live here or fight him to the death for her. But seriously.. I have a friend who does have one as a "house dog" and the best "dog" I have ever seen. . When we moved our fridge to the other wall, we made a pantry all around it, pet stuff on the right, DHs snack stuff above, seed and canning to the left. Again, all the way up to the ceiling. I had to go back to see the Wolf. Then there was a black cat I didn't see the pictures last night. I have fur downs in the kitchen so they are 30 inch uppers. The other two options without fur downs is 30 inch uppers with the space above or 40 inch uppers without space. If I didn't have fur downs I would put in 40 inch uppers. What brands of stove top and oven am I looking at many types. One I would like to have is Blue Star but they are too expensive. Last edited by Worth1; May 31, 2016 at 04:01 PM. I would consider leaving more counter space between the stove and the sink, when you cook most prep work is done there or in the triangle (sink, stove, refrigerator). I love to cook and I am redoing my kitchen now. For functionality I am making this gap a little bigger, because I find myself doing all my prep work in the small space I have now between sink and stove. The fridge can be a little further as is usually the first stop then over to the area between sink and stove. When I was suggested this, I disagreed. Then I paid attention to how I cook. They were right, I basically only use that little bit space. Oops, I may be reading the new plan wrong, do you have two sinks now? None of this is exact dimensions. I have a program on my computer to do it and even walk around after you are done but I find it too much. There is simply no way too get more counter space and a 2nd sink both in any area of the kitchen. Much less any good amount of counter space. I just got a brain storm I will be back. This will work out great and I have two options and it will in effect close off the kitchen from the rest of the house like I wanted. The idea of putting the cook top where the bar is, is out of the question for logistic reasons. I also must point out that I am limited on what I can do. There is a support beam over the bar. This is what my pots and pans hang from. When I come up with these wild ideas I always do it to full scale and test it first. It is like the Christmas tree syndrome. It looked a lot smaller in the woods or at the store. I like this one and there are options. Look at the amount of counter space. Also if I move the pantry to the new location I can move the sink down and put the cook top on the wall adjoining the garage. I could even put the sink where the pantry almost was. By moving it I was able to use space that was needed for the pantry door. Two ovens can be stacked. There I am finished project over. I want to add I plan on setting what used to be the bar section back 2 to 3 feet into the living area. 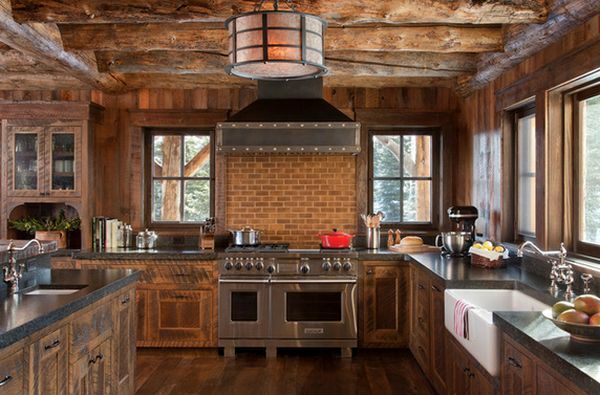 That is a rustic kitchen. Now back to the other design. Do you need 2 sinks, or can it be a double sink? With only one sink you would have a perfect setup. Cooktop in green pantry area, Fridge where the cooktop was. Huge working triangle, sink has access to dishwasher and lots of counter space between the two. The second sink is the one I can't find a good spot for. Edit, the cooktop won't be great in the corner, it is good to be able to move things around on both sides, so sink in the green pantry area, dishwasher next to that. Then cooktop where sink is and fridge on the other side where you had the cooktop. Where are the windows, because the sink would be better under a window. Last edited by sdambr; May 31, 2016 at 01:55 PM. or the second small sink can stay where you have it. Okay the cook top will never go where the pantry is, ever but I think I know what you mean. Yes I have a big double sink already. I want another single sink to go somewhere along the wall adjoining to the garage. The plumbing for the new sink is the plumbing for where the old washer hook up was in the garage. It is about 7 feet down the wall going towards the pantry. All I need to do is reverse the plumbing to inside the house. Here is why I want two sinks. When I cook I have a big sink full of hot soapy water so I can wash my hands and clean pots and pans as I go. I still need another sink to cook from like vegetables and so forth. This sink will never have dirty dishes in it. It will also have filtered water going to it. It will be about the size of a single wet bar sink or like the one I have in the garage. You just cant have enough sinks. This is one of the number one faults I see in every home kitchen. The other one is too much fancy BS stuff like wood work that cost a ton of money. Those are the Better Homes and Gardens Kitchens. If that is your thing fine it isn't mine. I can take the money saved on that and put it into good cook tops and ovens and still come out ahead. I want a mini restaurant kitchen that is a practical work space like my garage turned into. I can say one other thing I gave it about a year or so to see what I was going to do. There is going to be one heck of a lot of glass Pyrex cooking stuff hit the curb. It has sat there for years taking up space and done nothing. I hated then and I hate it now. Consider dropping the small sink: Use the ex-plumbing to feed a pot-filler over the cooktop. Move the cooktop to the small sink wall, where there's plenty of room for the larger range with counter space on either side. Use 48" full range and save having separate ovens. Then there would be space for wood-burning oven.